Two of the great scientific and technical revolutions of the 20th century were the discovery of the quantum nature of the submicroscopic world, and the advent of information science and engineering. Both of these have had a profound effect not only on our daily lives but on our worldview. Now, at the beginning of the 21st century, we see a marriage of quantum mechanics and information science in a new revolution: quantum information. 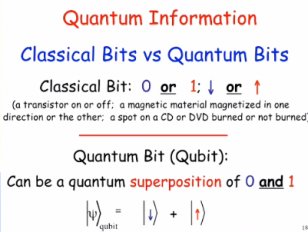 Quantum computation and quantum communication are two aspects of this revolution. The first is highly speculative: a new paradigm more different from today’s digital computers than those computers are from the ancient abacus. The second is already a reality, providing information transmission whose security is guaranteed by the laws of physics.